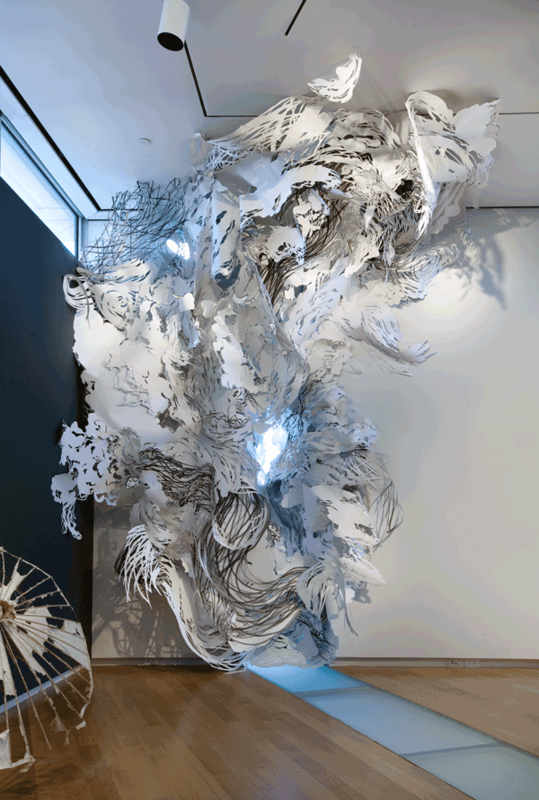 I make site-specific cut paper installations, ephemeral drawings in both two and three dimensions that blur the line between actual, illusionistic and imagined space. Sculptural and often glowing with natural or artificial light, these imaginary weather systems appear frozen in an ambiguous moment, bursting through walls and windows, or hovering within a room. My process is very intuitive, based on spontaneous decisions in the moment. I begin by making loose line drawings in India ink on large rolls of paper. Then I cut out selected areas between the lines to make a new drawing in positive and negative space on the reverse. 30-80 of these cut paper pieces form the final installation, which I create on site by trial and error, a 2-3 day dance with chance and control. Existing only for the length of an exhibition, this weightless world totters on the brink of being and not being, continually in flux. It is my mediation on creation, destruction, and the transient nature of reality. 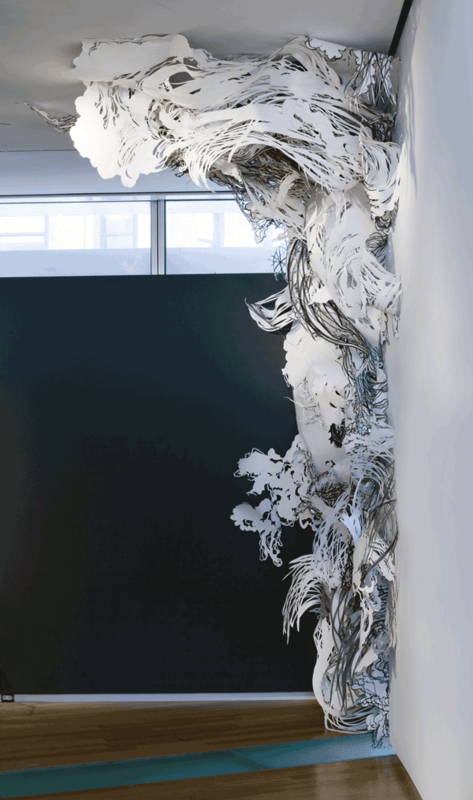 Since receiving her BFA from Cornell University in 1996, Mia Pearlman has exhibited internationally in numerous galleries, non-profit spaces and museums, including the Museum of Arts and Design (NY), the Montgomery Museum of Art (AL), the Centre for Recent Drawing (London), and Mixed Greens (NY). Upcoming shows include the Renwick Gallery at the Smithsonian. 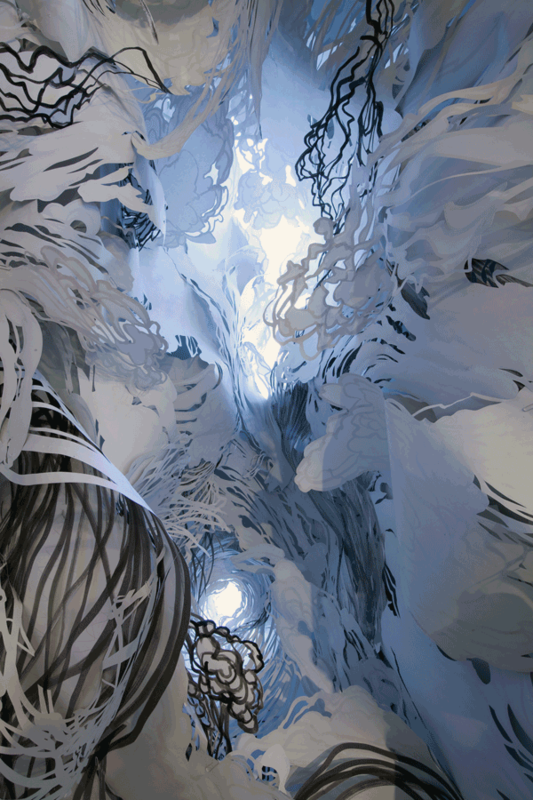 Her work is featured in several books on the use of paper in contemporary art.